Shreveport landmark restaurant open on Sundays for the first time! Mimosa – A classic that’s always perfect with any entrée. 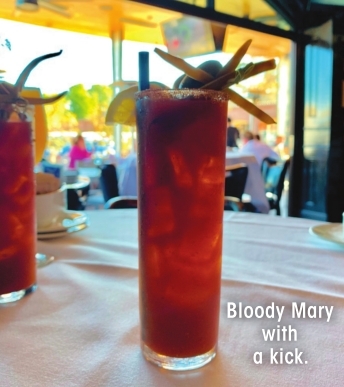 Bloody Mary – Their version has the right amount of kick that’ll make you want to get another one. Eggs Benedict – An English muffin topped with ham, poached egg, hollandaise sauce and sautéed shrimp. A unique twist on a brunch staple. 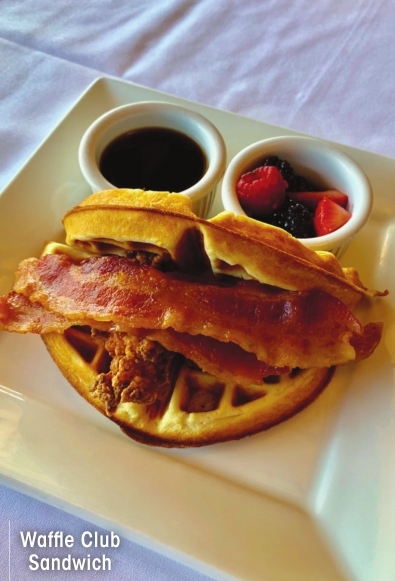 Waffle Club Sandwich – You had me at waffle. 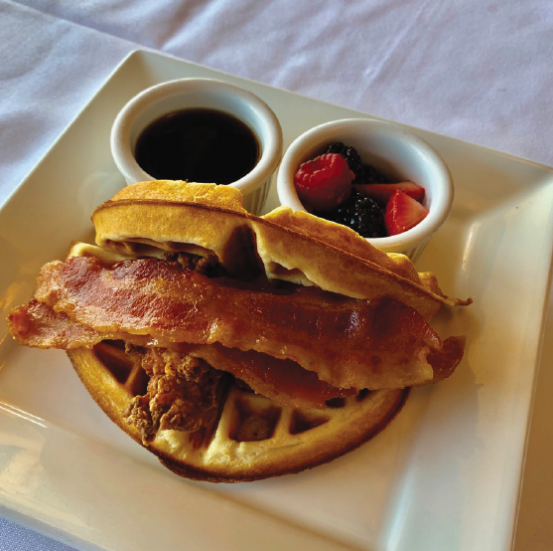 Perfectly seasoned and fried chicken breast, topped with candied bacon and sunny-side-up egg nestled between homemade Belgian waffles, finished with warm maple syrup. Or you can be cool like me and have yours served without an egg. French Toast & Fruit Cup – Golden French toast stuffed with citrus cream cheese, topped with a caramel banana sauce and served with a fruit cup. You can never go wrong with anything that’s stuffed with cream cheese. Cheese Grits & Grillades – A Louisiana brunch tradition with panseared strip loin cooked in a roux, served over stone-ground cheese grits and finished with a biscuit. Cheese grits are always a great choice. Vibe: The combination of the jazz band and the new wide-open patio doors make it an exciting new place for brunch in Historic South Highlands. If brunch isn’t your thing, but it should be, Superior’s is now open for dinner on Sunday nights, too. Mon-Thurs 11a.m. – 2:30 p.m., 5:30 p.m. –10 p.m.
Friday 11 a.m. – 2:30 p.m., 5:30 p.m. –11 p.m.
Saturday 5:30 p.m. –11 p.m.
Sunday 10:30 a.m.-2:30 p.m., 5:30 p.m.-10 p.m.